Google now offers a way for anyone to get out and stay out of its Wi-Fi location database, the company announced. Following last year’s Wi-Fi snooping scandal, Google is looking to make amends by allowing anyone to opt out from having their wireless access point included in the Google Location Server. To refresh your memory, Google collects basic Wi-Fi data from network routers including Service Set Identifier (SSID) information and Media Access Control (MAC) addresses. This information is used to help the company improve the accuracy of some of its location-based products, such as Google Maps, by matching publicly broadcast information about local wireless networks with their approximate geographic location. This method of location approximation can be more efficient than GPS, as it’s faster and works indoors, as well as being more battery-efficient. However, Google landed in hot water last year when its Street View cars also mistakenly collected Web browsing and communication data from Wi-Fi networks without password protection, which incurred the wrath of privacy regulators across the world. Google claims it has fixed the problem, and that it would destroy records of some 3.6 million Wi-Fi SSIDs it has collected. 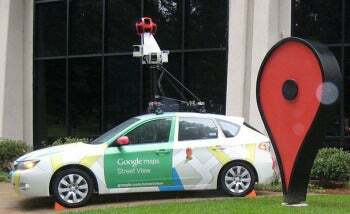 A Google Maps Camera Car, which is used to collect imagery for Maps and location data for Google’s Location Server. Google says it has explored different approaches for opting-out access points from its Location Server and thinks it found a method that has “the right balance of simplicity as well as protection against abuse.” The method involves modifying your wireless network name so that it ends with “_nomap”. So for example, if your SSID is “My Network”, you will need to change it to “My Network_nomap”. Once you’ve changed your network name, next time a user’s device sends information about your Wi-Fi access point to the Location Server, Google will note the “_nomap” tag and remove the access point from its records. If you need more help with changing your Wi-Fi network name, Google has this useful help article. The company believes this approach will help Wi-Fi networks owners to protect against others opting out of Google’s Location Server without the owner’s permission. Google also hopes other location providers will adopt the “_nomap” string universally in the future.